WE BRING THE WORLD TO YOUR DOOR The Berkshire Hathaway name stands for unquestioned financial strength and smart business decisions. 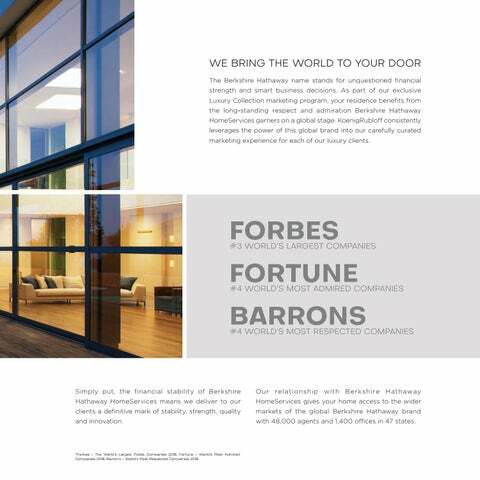 As part of our exclusive Luxury Collection marketing program, your residence benefits from the long-standing respect and admiration Berkshire Hathaway HomeServices garners on a global stage. KoenigRubloff consistently leverages the power of this global brand into our carefully curated marketing experience for each of our luxury clients. with 48,000 agents and 1,400 offices in 47 states.